What are you doing next Friday? I know for sure – on Friday November 3rd I am at the TEDxRotterdam at De Doelen. I bought my ticket here www.tedxrotterdam.com 2 weeks ago, because TEDx events always sell out quickly and I want to be sure that I reserved my seat. I am looking forward this day very much because last year TEDxRotterdam changed my life. How did it happen? I will tell you at the end of my story. 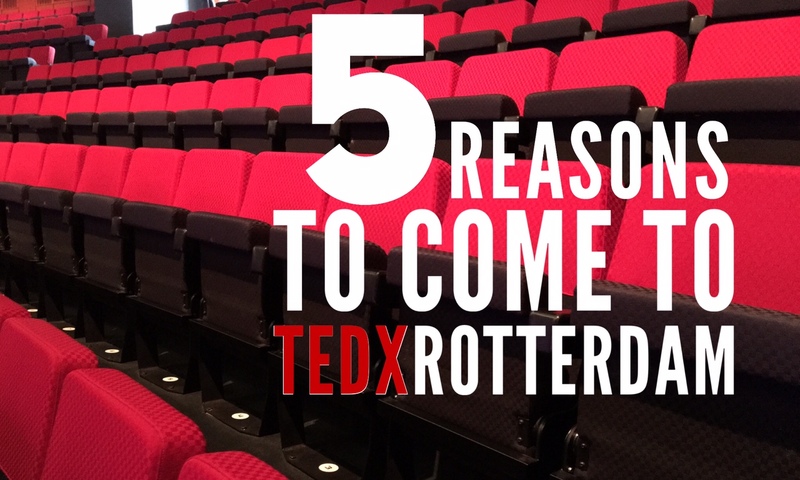 First I’d like to share with you my 5 reasons to come to TEDxRotterdam. In a city like Rotterdam (or any big city), most of us take the same route every day, talk to the same ten people, eat the same cheese sandwich. Every once in a while we have to stick our heads out of our routine and ask ourselves: Wait, why do we do this again? Life is full of stereotypes. People who work in the office, think there is no life outside the business center. Freelances are terrified with the thought that they might ever need to sit behind the desk from 9 to 5. TEDxRotterdam is a one-day conference that lets you take a step back from your everyday life to ask big questions. This will help you see two things: The world is endlessly interesting, and there are people working tirelessly to make it better. Developing a personal brand is essential for every entrepreneur. Nobody will know how cool you are or how special your product is if don’t go out there to tell about it. And even though you regularly create amazing Social Media posts from the comfort of your cozy sofa, you still need to leave your house and show your face. When you finally show your face in real life, people do an “ah-hah and put a face to an Twitter handle or Instagram avatar.” I know, because it’s happened to me walking at the Dutch Design Week and someone recognizes me! “Hey, you’re @26deco! Last month I ordered a personalized photo frame from www.26deco.com for my girlfriend!” It’s the coolest thing ever, and it’s an immediate ice breaker for engagement. Off course, you are a pro in your field and know everything (or almost everything) in your industry. But what about the new knowledge? The problem with the wide spread of internet is we believe that everything is at our fingertips. And maybe it is. But it’s an overwhelming amount of data that we often can’t crack, or keeps us from the best material. A conference like TEDxRotterdam will help curate new ideas to help you improve your approach. There’s nothing like being in a room of like-minded people. Other people who are willing to take time away from the office to learn something new. Other people who want to “better” themselves. The whole day is organized and planned ahead for you. All you need to do – is to go with the flow. First, you take your seat a big beautiful hall with like-minded people and listen to the inspiring talks of the speakers. Then you go out to the lobby for a break to have a complimentary drink and a snack. Then you go to a pop-up library, where every attendee has brought his or her favorite book and swop your book for something new you’ve wanted to read for a long time. Then you go back to your cozy seat in the big hall and get surprised by the fact that TEDxRotterdam is not only talks and speakers, but also amazing performances and shows. Then it is lunch time and you get free sandwiches and drinks. You also get an opportunity to talk to the speakers, meet online influencers and by that time it seems like there are only familiar faces around you! I’ve made some amazing connections and even more amazing friends from going to TEDx Events. And I never forget that strong and successful women I met last year at TEDxRotterdam at Van Nelle Fabriek. She was a Tax Advisor at the big accounting firm, had two kids and !!! started a webshop with her hand-made jewelry. It was so inspiring for me that in a month I was sitting at Chamber of Commerce (KVK) opening my company: Art Letter Lab “26 Deco”. I had a collection of my own photographs of natural object that resemble letters. For years I was saving those photographs on my computer and letting them just sit there. But now on my website www.26deco.com everyone can become an artist and create any word from my photos. I frame it in beautiful photo frames and it makes a perfect gift for any occasion or a unique interior design item. This is my story of how TEDxRotterdam helped me to pursue what I was passionate about and make a successful business out of it! So I am definitely going to TEDxRotterdam at De Doelen on November 3rd! And you? Purchase you ticket at www.tedxrotterdam.com and treat yourself to a day full of inspiring talks, interesting conversations, and new ideas. Sign-up for our monthly newsletter: your source for the latest trends in interior styling, design and home decoration.